Lay preacher Rosalie Sugrue's short plays and meditations are ideal to present in church. They encourage us to engage with Bible and historical characters and explore important themes. Staging is simple. Few props or costumes are required. Nearly of these play readings are suitab... read full description below. Lay preacher Rosalie Sugrue's short plays and meditations are ideal to present in church. They encourage us to engage with Bible and historical characters and explore important themes. Staging is simple. Few props or costumes are required. Nearly of these play readings are suitable for children to present. Most work best with a combination of children and adults. The book was revised & expanded in July 2018. * Some of these plays have been revised to provide clearer instructions for staging them and to simplify or improve the dialogue. * ANZAC Day has been re-written. * A second version of Mahlah & Sisters - The Daughters of Zelophehad - has been added. It is the same story told in less words and is suitable for devotions at fellowships, house groups and youth groups. * A second version of A Christmas Story has also been provided, with 9 separate pages of 9 separate scripts for 9 people. * The typesetting of the book has also been updated. Maori words now have macrons where needed. * Mary Jones' Walk - Relive the story of the 15-year-old Welsh girl who walked 25 miles in search of a Bible and by doing so helped inspire the founding of Bible Society. * When The Treaty came to Mangungu - An historic event told from the perspective of Rev John Hobbs' 11-year-old daughter Emma. * Easter Women - Listen in on five women who may have shared a room on that Saturday night so long ago: Mary of Nazareth - the mother of Jesus, Mary Magdalene alias Mary of Bethany, the 'other' Mary, Joanna and Salome. * ANZAC Day - Two children learn more about their family connection with World War One. Suitable for presenting in church when reflecting on war. * The Wesley Saga - A rhyming romp through the family history of Samuel and Susanna Wesley, sons John and Charles and their sisters. * A Peace Presentation - Monologues of two women from the scrolls of Hebrew Scriptures and two from the pages of New Zealand history. Ordinary women who by wit and will were each peace achievers. * Mahlah & Sisters - A justice issue Bible story for any time of year. Five capable daughters successfully lobby for women to be able to own land. * Mahlah & Sisters (B) - The Daughters of Zelophehad - the same story told in less words; suitable for devotions at fellowships, house groups and youth groups. * Christmas Women - multiple uses during Advent. Five meditations of women sharing their encounters with Mary for use in advent worship: Elizabeth (Mary's cousin) talks with Anna; Anne (Mary's mother); Woman Traveller; Inn-keeper's Wife; Anna (the prophetess). * No Room - Makes a thought-provoking link between refugees arriving by boat at Christmas Island and Mary & Joseph finding no room at the inn. * A Christmas Story - 13 stick puppets. Theme: God is with us. *A Christmas Story (B) - a second version of A Christmas Story with 9 separate pages of 9 separate scripts for 9 people. "The pattern of Sunday worship is generally fairly predictable, but congregations appreciate something different at family services and especially at Advent and Christmas. After making suggestions about an Advent wreath and candles, Rosalie offers five meditations that may be used during the four Sundays in Advent, two meditations being read on one of these Sundays. The meditations titled 'Christmas women', are the voices of Elizabeth (Mary's cousin), Anne (Mary's mother), a woman traveller (one of many women on her way to Bethlehem for the census), the inn-keeper's wife, and Anna (the prophetess). These Advent meditations are followed by a play titled 'No Room,' designed to promote the work of Christian World Service at a time when the annual CWS Christmas Appeal will be presented to many congregations. The play features two modern day families who learn that making room for Jesus includes making room for asylum seekers and that giving to CWS can help make lives better for people living in dreadful conditions. One of the appealing features of this collection is the prominence of women throughout. The drama 'Mahlah and Sisters' draws attention to five little-known young women in the biblical narrative. Their stand for justice translates effectively to women's rights and equal opportunities in today's society. They are highly commended as a resource for any church or group seeking imaginative ways of presenting gospel ideas and aspects of faith in action. Ten Plays is also available as an ebook." 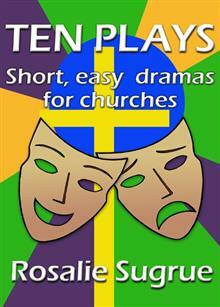 "This collection of dramas by Rosalie Sugrue will be welcomed by church leaders. At a time when the church is struggling to fully engage people, she has provided us an extra resource for those special seasons and occasions that will add interest to worship services as well as to other church events. The relevant themes and easy scripts have the ability to involve people of all ages and stages. Rosalie's ready-made dramas have already had wide acceptance for their appropriateness to the New Zealand context and their ability to easily capture the imagination of those in our congregations."